(Left to right) Peter Altmaier, German Minister of Economy and Energy; Dr. Jochen Köckler, CEO, Deutsche Messe AG; Ngakan Timur Antara, Acting Director General of Industrial Resilience and International Access Development, Indonesian Ministry of Industry; Airlangga Hartarto, Minister of Industry of the Republic of Indonesia. Jakarta/Hannover. 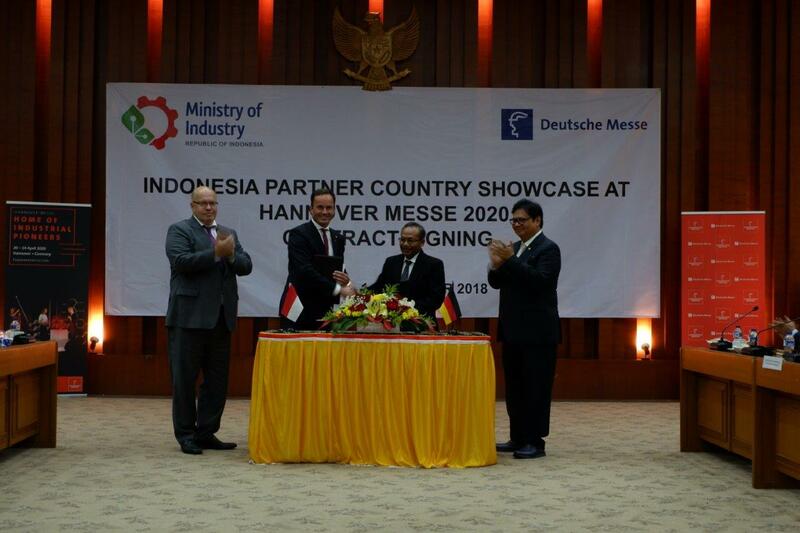 Indonesia will be Partner Country at HANNOVER MESSE 2020. Ngakan Timur Antara, Acting Director General of Industrial Resilience and International Access Development, Indonesian Ministry of Industry, and Dr. Jochen Köckler, chief executive officer of Deutsche Messe AG, confirmed this at the Partner Country contract signing on 1 November in Jakarta in the presence of German economic minister Peter Altmaier. 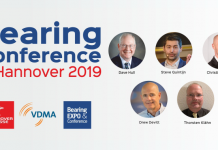 “Integrating the ‘Making Indonesia 4.0’ initiative into the national agenda is critical to Indonesia, because manufacturing is the key economic driver and contributes more than 20 percent of GDP – the largest share among all sectors. 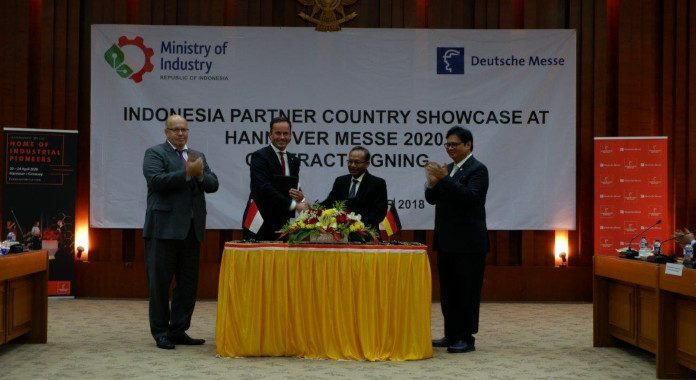 As Partner Country of HANNOVER MESSE 2020 we will introduce the “Making Indonesia 4.0″ roadmap to the world and seek investments to upgrade manufacturing capabilities and develop a digital infrastructure,” said Airlangga Hartarto, Minister of Industry, Republic of Indonesia, at the ceremony. Germany and Indonesia have maintained an economic relationship for many years. The total trade value between both countries reached more than six billion US dollars in 2017. German direct investment totaled 289 million US dollars in the same year. 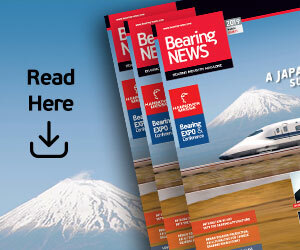 At present, more than 250 German multinational companies – including Festo, Robert Bosch, SAP, TÜV NORD, Siemens, MAN, ThyssenKrupp, BASF, Bayer, Daimler, and BMW – do business in Indonesia. German investment projects in Indonesia are concentrated primarily in the metal, machinery, chemical, pharmaceutical, transportation, storage, and communications industries. 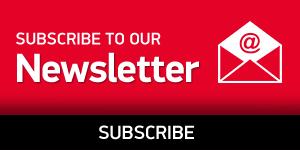 Every year, HANNOVER MESSE spotlights a selected country. This partner country not only draws the attention of visitors and the media, but also plays a role at the highest political level. 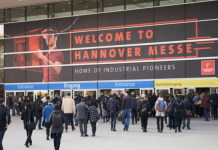 HANNOVER MESSE’s most recent partner countries were Mexico, Poland, the USA, India and the Netherlands.